War Stories: Fire in the Hole! — PhoneDoc - Louisiana's Most Trusted Mobile Repair shop - iPhone, Samsung, Android, Tablets, and More! 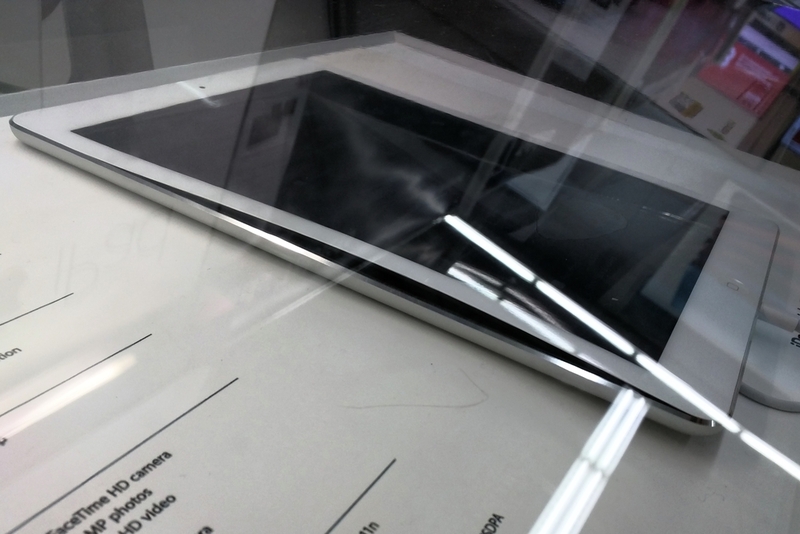 What started out as a relatively straightforward iPad Air screen replacement ended in a way that nobody expected. 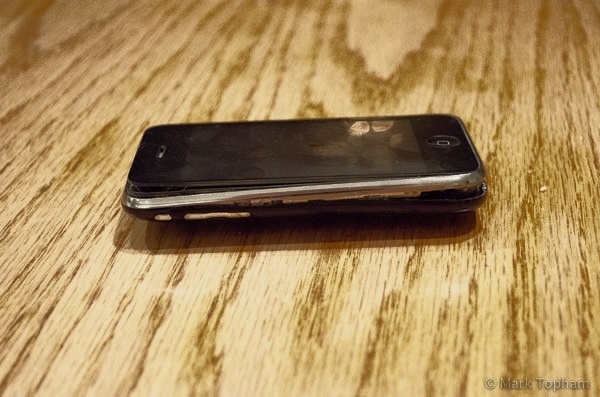 This is a cautionary tale for anyone working in mobile repair. It was a seasonably rainy, early-spring morning in South Louisiana. Undeterred by what some consider "bad" weather, our customer brought what appeared to be an unexceptional iPad Air screen repair. While passing through airport security, the screen took a little bit too hard of a bump and shattered. At least that's all we thought had happened until we removed the shattered screen and found the mess beneath it all. This puncture was caused by a loose screw dropped during assembly. Underneath the LCD, lodged in the center of the upper battery cell, was a small black screw. The same type of screw is used to secure the logic board to the housing of the iPad, only none of them were missing. This one was an extra. Under pressure from behind the LCD, this "bonus" fastener had burrowed its way through the battery's protective plastic/foil layer and punctured the inner workings. This lithium-ion cell had swollen about 50% beyond its normal thickness due to outside air & gases entering the sealed environment. Once the chemical balance is contaminated, the whole thing tends to loosen up and bloat with gaseous pressure forming throughout the tightly-wound inner layers. It was this swelling that pushed outward on the LCD and touchscreen, applying a permanent tension that made it much easier than normal to crack if it was bumped or compressed just right. Because of the puncture, failure, and swelling, this battery needed to be replaced before the iPad could return to service. As soon as we began to release the adhesive holding the battery to the frame, it erupted in a violent cacophony of sparks, smoke, and white-hot flame. Our heroic GM quickly shuffled the blazing iPad out into the parking lot before it could ignite or asphyxiate anyone. The battery continued to burn and churn out white smoke for about 60 seconds, and the building was evacuated for a couple of hours while we cleared out the toxic cloud that had billowed from the ruptured cell. We weren't able to capture any of the action while it was happening since our main concern was controlling the situation, but the aftermath seen here shows just how serious it was. Those aren't raindrops - the battery's outer coating boiled & melted as it burst into an inferno of smoke & sparks. Burn marks, soot, and discoloration around the affected area. The back housing is warped & discolored from the extreme temperature produced by this battery explosion. 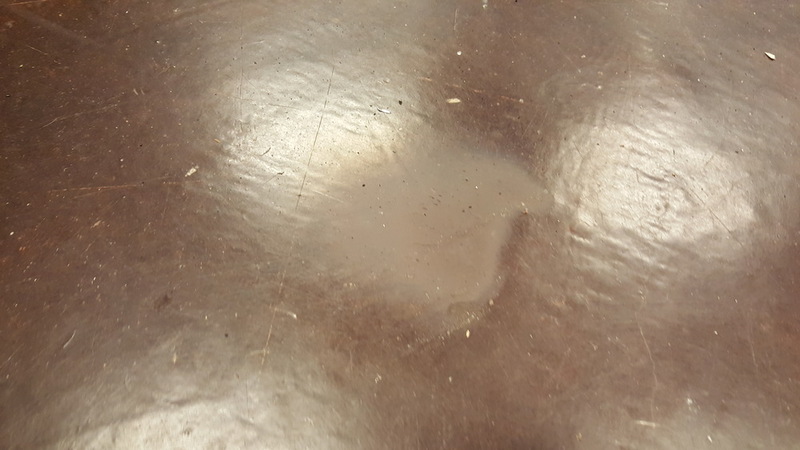 Heat damage on our concrete floor, where the iPad landed for only a few seconds while erupting. The iPad was rendered inoperable by the intense heat, but we're thankful it was the only casualty. Had this battery exploded while it was on an airplane or in a car while driving, people could have certainly been injured or killed. The flames would have ignited anything combustible and the cabin would be filled with a thick, poisonous smoke, as blinding as it is toxic to breathe. We're truly fortunate that this happened when & where it did, where we could control it to some extent. Even so, this is not something I personally ever want to experience again. We immediately looked inward to identify the cause of this dangerous explosion. If this was our fault, we must identify why and how so it never happens again. We're not talking business here - the health & safety of our techs, neighbors, and customers comes first. The thing is, this battery was damaged prior to the device ever being opened. The cell that burst was not the one that had been punctured - that cell was completely dead. Based on the evidence, the remaining good battery cell was performing double-duty to make up for its disabled counterpart. Over-stressed and possibly over-charged, all it took was a slight change in orientation to set off the whole reaction. All the flames and smoke burst out from the area where the cell connects to the battery logic circuit, opposite from where we began to remove the adhesive. This slight movement could have happened at any time under the right circumstances, such as dropping to the floor or bouncing around in a bumpy car. According to the owner, it had never been serviced before they brought it to us. That means the last time this iPad was open, it was being assembled prior to sale. Based on the workmanship errors we found, we suspect this iPad was a refurbished device and not one that came directly off the Apple assembly line. In addition to the extra screw haphazardly dropped between the LCD and battery, we noticed the protective flashing strips had not been removed from the Wi-Fi antennas prior to the touchscreen installation. These types of workmanship failures are more likely to happen in a refurbishing facility, where devices are rebuilt individually as opposed to the tightly controlled assembly lines where brand-new devices are built. We have no interest in making other technicians look bad, but this simple oversight almost hurt someone and we do take that seriously. Great - - Now I'm paranoid that my battery is going to explode. Help! Paranoia isn't going to help anyone. We do hope to impart a healthy awareness and understanding of the danger a malfunctioning battery can present. While it's easy to identify a problem while the device is open, it can be harder to notice during an exterior examination. 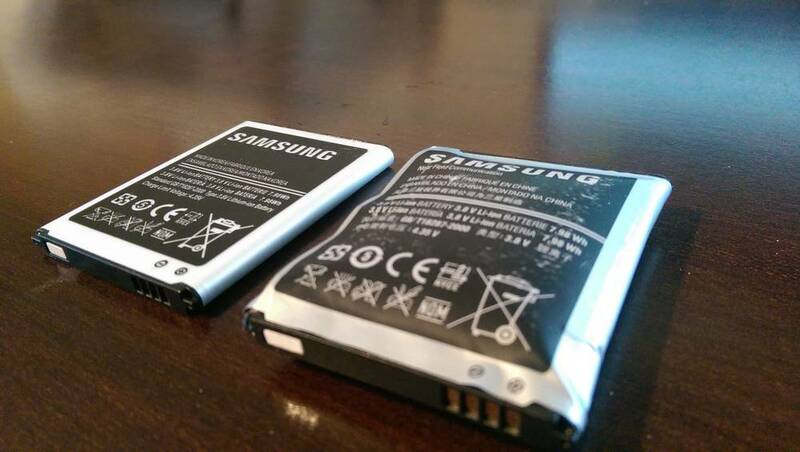 A severely swollen battery will push everything around it outward, so if you notice the screen of your phone or tablet bowing out from the center, have it inspected as soon as possible. Aside from physical damage, some other causes of swelling are water damage and depleted life-cycles (old age). If you notice decreased battery life, have it checked out. Any time we notice a swollen or bloated battery, we recommend replacement. At PhoneDoc we don't charge for battery diagnostics, so if you have any reason for concern please play it safe and let someone check it out. Battery failure on this display model is causing the screen to lift. Almost every manufacturer provides at least a 1-year warranty on their devices, so if your phone or tablet battery fails within that time period you should definitely look into having them replace it. What is the takeaway here? Is it that your phone or tablet could suddenly blow up and kill you? While technically true, manufacturing and operational standards are in place to prevent exactly that -- which they do to great effect. What about refurbished devices - can they be trusted? For the most part a refurbished device can be a great low-price alternative to buying a new-in-box product. Just be aware that your device was refurbished by another human, so it may be prudent to verify that particular human's reputation. The real lesson here is directed towards our fellow members of the repair community. Phrases like "quality workmanship" sound great in marketing, but what does it really mean to take pride in your craft? Would you be more careful if you knew a mistake on your part could mean injury or death for someone else? In every industry you'll find shady, lazy, and incompetent people, but in our experience those are the exception and not the rule. By and large, independent shop owners really do care about the quality of work they put out. We hope by sharing this story, maybe one more repair technician or DIY-er will be inspired to put forth the extra effort, making sure their product not only works great but is safe to use.